This personalized soft, cuddly, Brown Plush Bear shows the love you both share each and every day. Perfect for any romantic holiday or celebration. Our premium, super-soft Gund Teddy Bear has amazingly silky fur. With a broad smile and big nose, this two tone bear is a big winner with anyone who holds it! 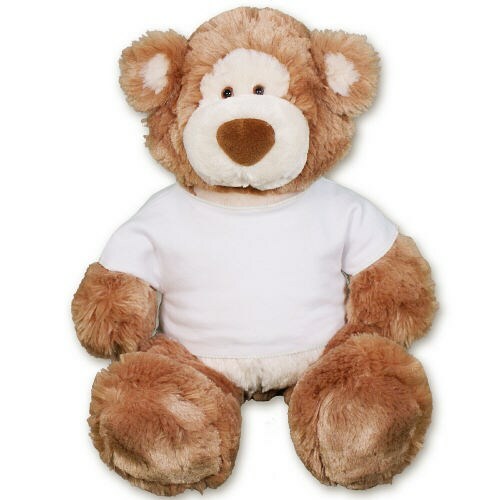 This Teddy Bear measures about 18" and wears a shirt that includes free personalization! We will personalize your "Bears in Love" Teddy Bear T-Shirt with any two line custom message. Free gift wrapping and a free gift card to make your Valentine's Day gift experience a little bit easier! Additional Details Personalized Teddy Bears make for great Valentine's Day gifts to display your love. If you like this one, make sure you check out our other great love gifts like this cute plush lion or this giant soft white bear.